So much has been going on here in our humble little home in Albany, NY. So much that it is slightly overwhelming and tiring and has sapped my energy or should I say “desire” to turn my computer on at night. I’ve been a lazy “iPhone poster” who doesn’t care much about her spelling mistakes when it comes to posting. No, it has absolutely nothing to do with the fact that the tiny lettering is blurred by my old vision in anyway. *wink*! The events in our life that have had me busy? Well, for one, our house finally sold. Yippee! Thank the Lord, Hallelujah! Seriously folks. One more month of having to pay rent and mortgage along with everything that comes with running two households would probably have had us spiraling downward pretty fast. The closing took forever and I don’t mean forever for just us. I’m sure it felt like forever to the buyers also….whom I am very happy to say, happens to be a young man I’ve known since he was a toddler whose mom was my friend and he played with my children when growing up! I’m so pleased and happy with who bought our home and I sincerely hope they thoroughly enjoy it. Our Real Estate Agent, Sherri Stone was totally awesome. She went way above and beyond for us and even went as far as taking a few fellow agents with her to our home and mowed our yard that I fretted about getting taller and taller as we waited for the closing to arrive. If you live in northern NY area and you are looking for a killer Realtor, you won’t go wrong if you choose Sherri. Words cannot express how thankful we are that she put so much effort into helping us sell. She more than earned her commission and I wish we had made a killing so we could have given her a big fat bonus on top of it. As it is, we were lucky to sell our home in this market that is definitely not for the seller at this point in time. So, all that said, Thank you to Sherri for your awesome hard work, and congrats to the buyers on becoming first time homeowners. 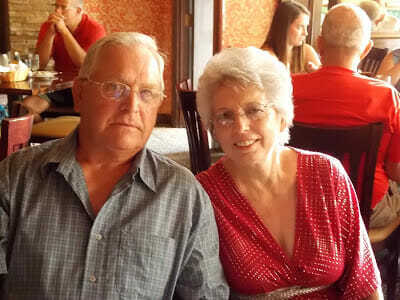 Next, not only was it Grumpy and my 8th anniversary this year, but it was a milestone anniversary for my awesome parents! 50 years ago, my Dad and Mom were married. They flew to Albany on a commuter flight (a first), spent a couple days with us and were joined by my brother Steve and his family. 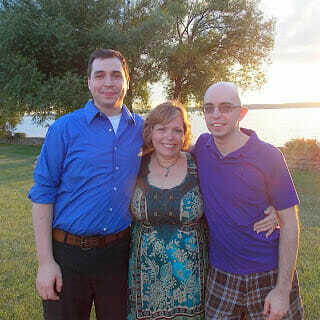 We all took a family trip that included my Aunt Ann who lives in my area and went to NYC where we met up with my cousin Ryan (my Aunt Ann’s son) who lives in Manhattan. Ryan was awesome and took us on a guided tour of the city. You can view the Statue of Liberty from Ryan’s apartment roof and its an awesome view of the city where you can look in one direction to see the Statue of Liberty and then in the other direction where you can see the new towers going up at Ground Zero. We visited Central Park, Ground Zero, Times Square, Ripley’s Believe it or Not Museum and Bryant Park, then we all took the train back to Albany. A first vacation for my family together in a long time, and it felt great. After our NYC excursion, we all went north to Mom and Dads and that next weekend my brothers and I took our parents to The Granview in Odgensburg for a celebration of their anniversary. 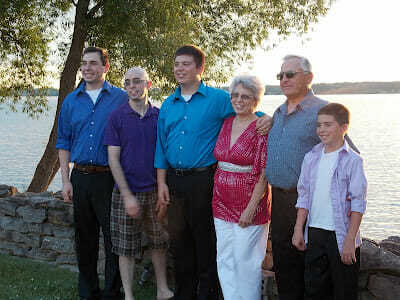 There were gorgeous photo ops as it is located right on the St. Lawrence River and we took this precious photo of Mom, Dad, and their 4 grandsons. Happy Anniversary to Mom and Dad – I hope you enjoyed your family togetherness and I hope we can celebrate 75 years with you also and by then maybe have some great grandchildren in the picture with you too! After all the excitement of Family celebration, we had another family celebration to attend the next day. 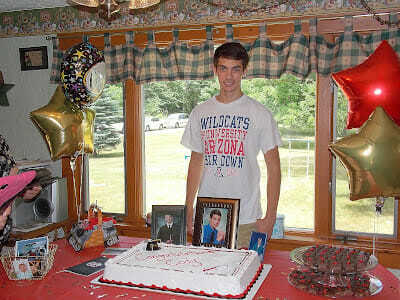 My cousin Andrea’s 2nd child graduated from high school and came to NY from Arizona to visit his grandparents for the summer. It was great seeing family we don’t see often and reconnect again. Sadly, for me, that Sunday I also had to say goodbye to my youngest Christopher. He moved to North Carolina with his cousin Eric that day and while I will see him again, he has moved more than 700 miles away from me and I was having separation anxiety. I never had to deal with any of my children being too far away from me. Usually never more than a 6 hour drive. Moving to Albany was hard, seeing Chris move to North Carolina was harder. He’s grown up though and needs to find his own niche in life, so I have to accept he is so far away and just look forward to having a sunny East Coast state to go visit when I want to see my Furr. I hope the very best for him and I hope he is very happy with his new life and all goes well! I have always told my children to do what makes them happy, not what they think will make me happy. I won’t be happy unless they are, so the best way to make me happy is to be it yourself. I can accept anything you choose to do, anyone you choose to see, because I know you are doing what you need to be happy in life and that is all that matters to me! So, we have had some exciting adventures and events that have been happening in our household. I feel like I have written a book to put all this out there! I have some exciting food news also. The Beijing Beef Sliders that I entered into Price Chopper’s contest? Well, I ended up taking first prize for that burger and won $1500 worth of Lowe’s gift cards! I was totally stoked and it gave me inspiration to want to create more recipes. Now that things have slowed down, I will have just the chance to do so. I will be participating with Buitoni in testing out some of their new pastas (ummmm, pasta love…..) and am very excited about getting creative in the kitchen with the pasta! I will be sharing the recipes I come up with you sometime in July so keep your eyes open for the recipe reveals and follow Buitoni on Facebook, Twitter, and Pinterest for the exciting recipe reveals! I am also participating in the Cooking Light Virtual Supper Club for July and the post will be up next Wednesday, on July 4th. Val, Helene and I were part of the original group who organized the supper club and all three of us will be posting along with Jerry and Sandi and Giz. Now, last, but not least, I will leave you with this delicious breakfast crepe I made this morning. It was so delicious I didn’t want to stop eating it! Whisk the dry ingredients together - flour, cornmeal, sugar, and salt. Stir in the beaten eggs. Mixture will be very dry and clumpy. Whisk in almond milk 1/2 cup at a time. Add flavoring and set aside in refrigerator for at least 30 minutes. Meanwhile, make the ricotta filling by mixing ricotta, extract, Splenda together until well blended. Fold in blueberries. Set aside in refrigerator until ready to use. Make crepes using a 9-inch nonstick skillet. Over medium heat, pour 1/4 cup batter into center of skillet and swirl to coat bottom of pan. When crepe begins to look bubbly and slightly dry on top, flip over to continue cooking - about 30 seconds. Remove from pan and place on platter to cool. 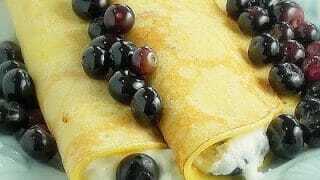 Next, layer crepes with a small sheet of wax paper between each crepe. 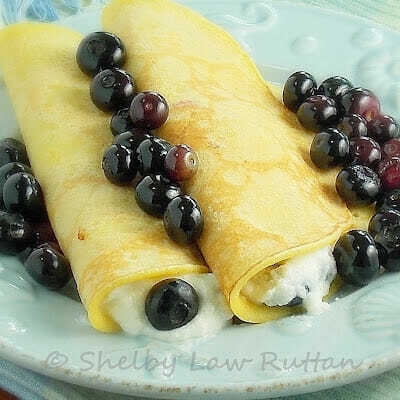 To serve, spoon 2 tablespoons of filling in center of crepe. Fold over and serve with more blueberries. You can store leftover crepes in the refrigerator or freezer. Prep time does not include sit time in the refrigerator for the batter prior to making crepes. Cooking time is per crepe. Wow! You have been busy. Congratulations on your big win! It must be a huge weight off your shoulders to have your house sold. This looks like a fabulous way to start the day. 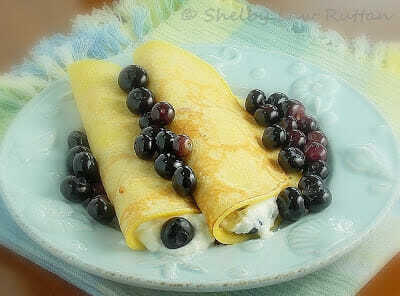 And we love crepes, so I must try them with cornmeal! Wow life really has been busy Shelby, so many exciting family events, selling your house and life is made easier. Let's all celebrate. this looks like the perfect mothers day brunch recipe!! yum! I love this recipe! I remember my mom saying she had taught us all to be independent but didn't realize that meant we would all end up living so far away. These sound absolutely heavenly! I adore anything with cornmeal and blueberries!